Maître Parfumeur et Gantier released Bahiana earlier this year to celebrate "The Year of Brazil in France". The fragrance is geared towards a younger market than the brand usually targets, and at the time it was launched, they had not yet decided whether it would be a limited edition or part of the regular line. It features notes of Brazilian orange, caïpirinha lemon, yellow mandarin, tagette, green leaf, rosewood, gaiac wood, elemi, amber, musk, and coconut. I have only tried Bahiana twice, and rather quickly at that, so these are early raves but I think I have found another summer favorite. The top notes are, like yesterday's Ananas Fizz, evocative of a tropical drink, but in this case the cocktail is a caipirinha, the popular Brazilian mixture of lime, sugar and cachaca (a liquor distilled from sugar cane). It calms into the scent of dry tropical woods, and as the citrus fades, it takes on a bit of tropical fruit — maybe pineapple, maybe not. Whatever it is, it is used judiciously, as the overall effect remains more dry than sweet. 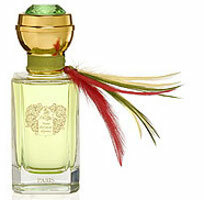 Bahiana is somewhat reminiscent of Ananas Fizz, actually, and also calls to mind Hermès Jardin Sur Le Nil. It does not smell exactly like either, but is something like a missing link between the two: if you found Ananas Fizz too cedar-y or Sur Le Nil too high pitched, this might be just what you are looking for. Personally I may just need all three, along with Eau Exotique by Parfums de Nicolaï, to round out my summer tropical fruit collection. It is nice to have choices. I cannot decide if I like the feathers on the bottle. Are they jaunty, or just silly? Maître Parfumeur et Gantier Bahiana is an Eau de Toilette. For buying information, see the listing for Maître Parfumeur et Gantier under Perfume Houses. I agree with V's vote for jaunty. Also, if you've ever seen Carnival, it's feather city. I hope most of them are fake, because I don't know how many birds can exist in the world after the millions upon millions of feathers are used to decorate bodies and floats. Brazilians are feather crazy, so it fits. Oh, it sounds like it smells nice, too Not for me, but the fruity/citrus/musky/woody scent is very big here in the tropics. OK, I'll go for that! Have never seen Carnival except in New Orleans…which also had lots of feathers, you are right. Ooh, fun-sounding! I'm open to anything at this point–well, almost anything! I've got my summer 2005 fixed, but maybe this would be good for 2006! Hi L! I think you would like Bahiana, and am hoping it will join the regular MPG lineup & so still be around in '06. N, I would guess that I am in a citrusy mood far more frequently than you are! In fact, when I started out on the road to fragrance addiction, it is just about all I wore. Hope you are well too dear! R – I used to love some citrussy fragrances but then something snapped – I bacame a happy woody-floriental gal! Hoping something will snap in me too, and that I will finally come to terms with the “dark side” of amber & patchouli. I still feel like I am closed off from half of the fragrance world. Yes that was MY 'Darth Vader' moment in my perfume addiction! I love Bahiana! It is indeed a nice complement to Ananas Fizz and Un Jardin Sur le Nil. I have all 3 and love them all. I really hope it becomes part of the permanent line as it is my favorite citrus scent of all time so far. I like the feathers! (I like the Pilar and Lucy froth too). But I also think the bottle looks rather nice – is that engraving on the front? Hi T, Glad to know I am not the only crazy who would buy all 3! I don't know if it is going to be my favorite citrus of all time but I am really enjoying it today, and it is working beautifully in the heat & humidity we are having. Looks like it is thumbs up all around on those feathers. I like the P & L bottles too. Hope that is engraving, but haven't seen the bottle in person so I couldn't say! I actually might enjoy a perfume that smells like caipirinha than the actual drink which never blew me over. Great review; I don't even like Ananas Fizz but you're making me want this. LOL — beware of wanting things you know you won't like, it is the sign of real fragrance addiction. If you don't like Sur Le Nil either, I would be very, very surprised if you liked Bahiana. I am probably making the 3 sound more similar than they are, but they all strike me as in the same family. Yes, the front of the bottle is lightly etched with the MPG logo. I think the feathers are synthetic or dyed – definitely not real parrot feathers! Thanks T, I thought so! I love Bahiana!!! I love everything about. Living here in Texas where it is hot 80% of the time, this fragrance lasts and lasts. I notice the citrusy scent of the lemons first then the dry down to the pineapple/coconut blend. The scent is so fresh and I love to spray it on after a hot shower. It is almost good to eat. I highly recommend this as a unisex fragrance….I’m tired of the “male snuffbox” scents out there and usually love the Gaultier type scents or Bulgai. MPG has a good line of scents, I think, however I didn’t like the men’s fragrances…..too flat for my taste! Bahiana smells like Brazil and it is my favorite and recommended. Bahiana is a great scent, and wonderful in the heat, agree!